Hi everyone, it's Lucy from Lucy's True Colours here with you today, to share a variation on Tim Holtz's custom ink pad, updated with Distress Oxide Reinkers, with a project using Ellen Vargo Eclectica stamps to make some useful gift bags. 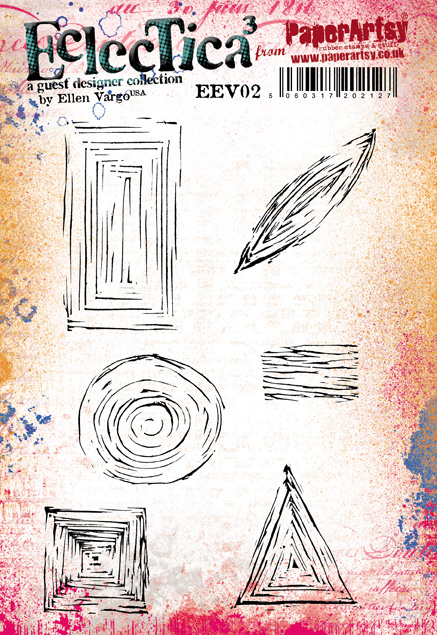 I remember being completely blown away when I saw Tim's idea for custom ink pads using cut n dry felt, details here. I couldn't believe it could really work, but I thought it was a complete game changer. 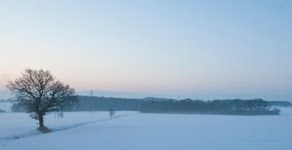 I loved the idea of not always having to have a black outline on images, and I thought it would be ideal when you want a huge number of images such as Christmas cards or wedding invitations. This post is by way of an experiment as I wasn't sure if it would work with Distress Oxide reinkers. 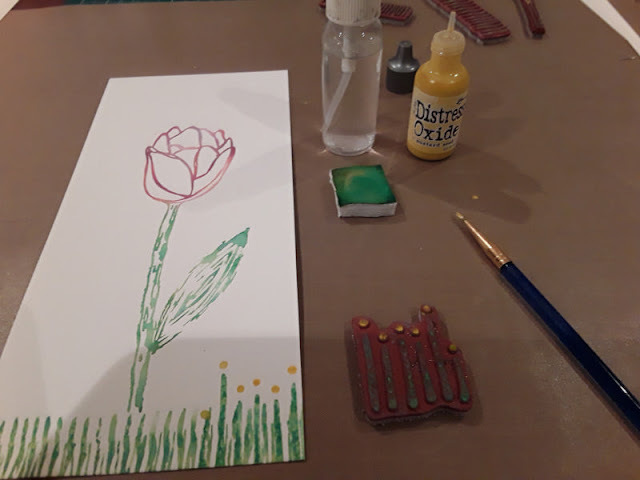 When I realized that it does, but that you have to spritz your stamp with water, I changed tack and decided to do a faux watercolour project, using watercolour paper. I found you could use either Archival or StazOn to stamp your image onto the felt, but for simpler images such as the stems of the flowers, I simply added a couple of shades of green reinker directly onto a piece of felt and dabbed it onto the stamp. I kept all my pieces of felt in self-seal bags once I had inked them. 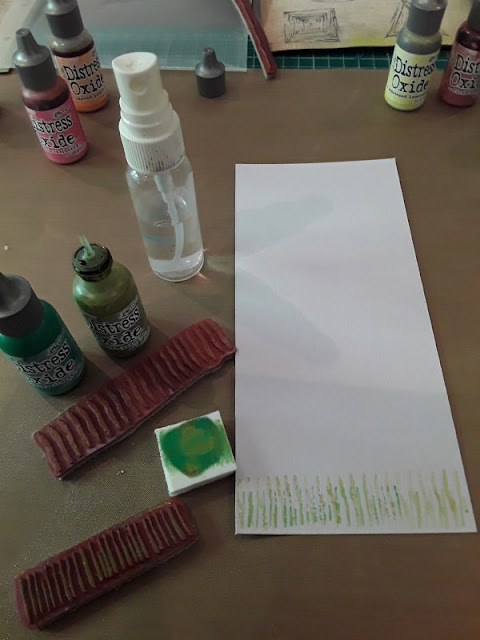 The other use I put the reinkers to was making a background using photo paper with a simple spritz and dip method. I loved the marbling effect on the photo paper but I didn't like using it in some ways as it tended to warp and was generally not a very user friendly product. 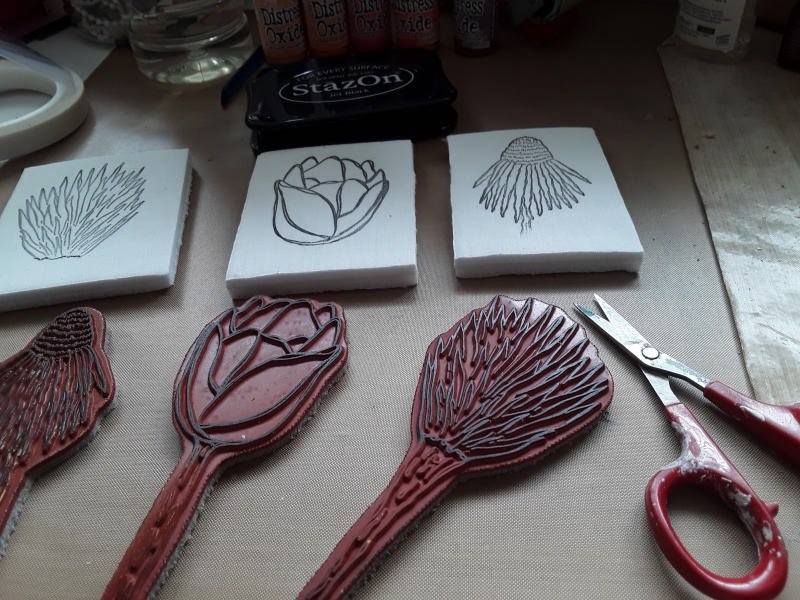 Whilst making this project, I was working with four sets of Ellen Vargo stamps, one was a set of three flowers which each had a sentiment, and the other three were abstract background stamps. As I looked at them, I wondered if I could perhaps use some of the abstract elements to create a design around my flowers. I thought the concentric circle shape could be my sun, the similar square shape could be a tub, the large bubbles could be clouds, the two sizes of lines could be grass, and the lines with dots could be tiny flowers. 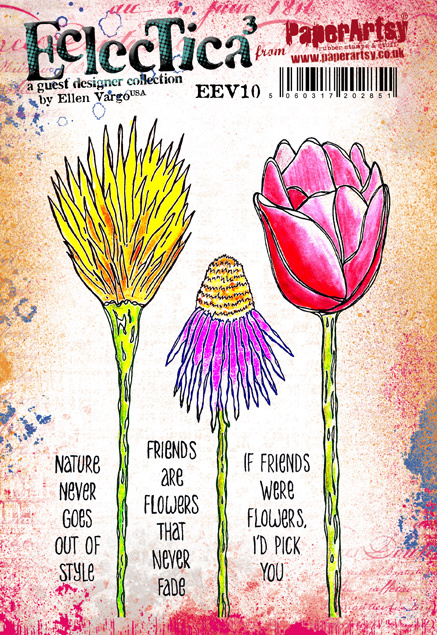 It was fun looking at the stamps in a new way to create some detail around the flowers. 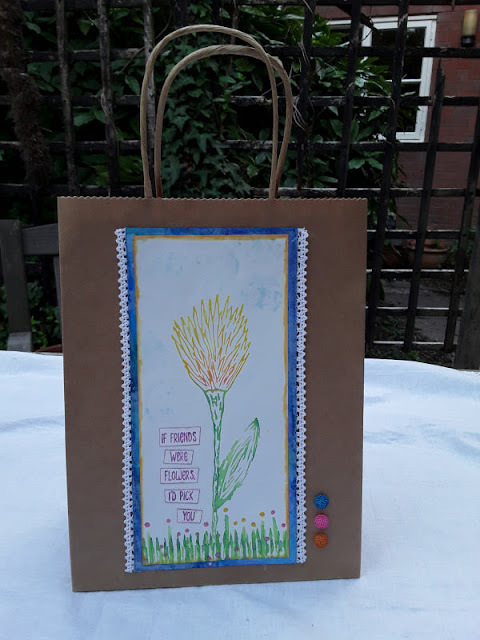 I decided my project would be gift bags as I find it incredibly useful to have these to hand to give little gifts to friends if I am going to someone's house for example, and I felt the custom ink pads would enable me to quickly replicate the design and make plenty. You'll need to stamp your image onto the felt side of the cut n dry felt using a permanent black ink. I was only concerned about having the flower heads. I then inked up a small piece of cut n dry felt with Peeled Paint and Lucky Clover reinkers and used this for the stem. 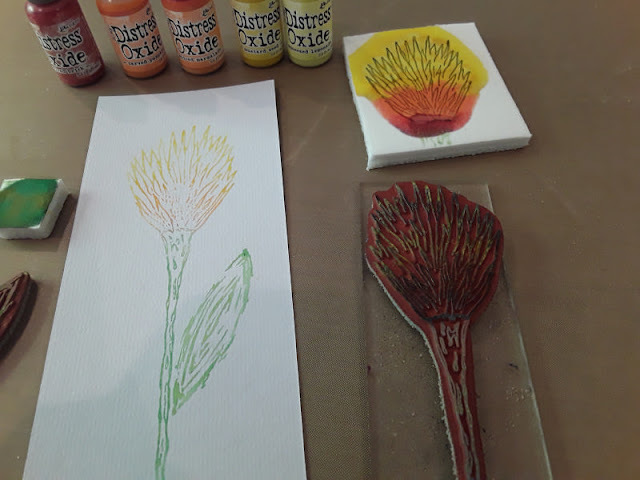 I pressed the flower head firmly into the prepared custom pad then spritzed the whole stamp with water, before pressing into the watercolour paper and leaving a moment. The leaf is from Eclectica Ellen Vargo EEV02. For the grass I used the same green cut n dry felt and the two line stamps from Eclectica Ellen Vargo EEV05. 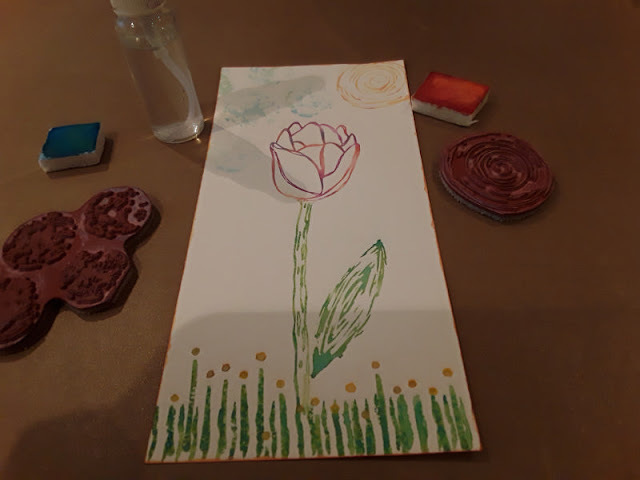 Here's a picture of the tulip stamp, just to mention the colours I have used here. They are Seedless Preserves, Picked Raspberry, and Dusty Concord. I think they have oxidized a bit more here. For the tiny flowers at the bottom I have used a stamp from the same set as before, Eclectica Ellen Vargo EEV05, and added little drops of Mustard Seed reinker using a paint brush. 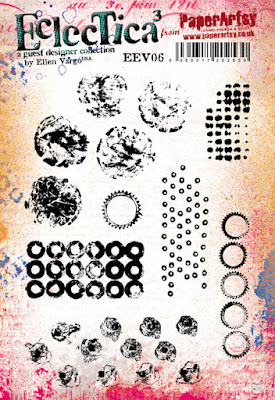 For the clouds I've used the large bubbles from Eclectica Ellen Vargo EEV06 with Broken China, and for the sun I have used the concentric circle from Eclectica Ellen Vargo EEV02. For the tub with the echinacea stamp I have used the square from Eclectica Ellen Vargo EEV02 with the same colour combination as I used for the tulip. 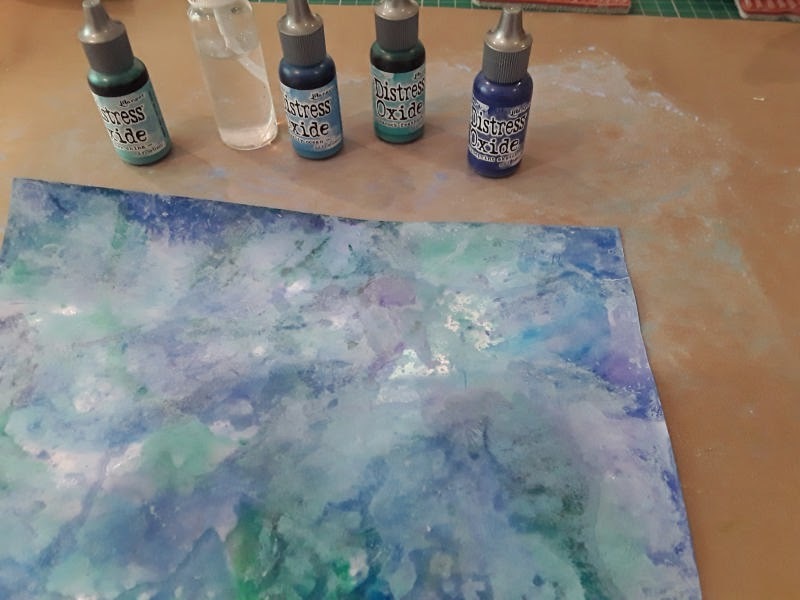 I made a background for my watercolour panels using photo paper with Broken China, Peacock Feathers, Blueprint Sketch, and Salty Ocean. To finish off, I painted some resin flowers with Fresco Finish paints in China, Tango, Bubble Gum, and Plum, to tie in with the colours used. 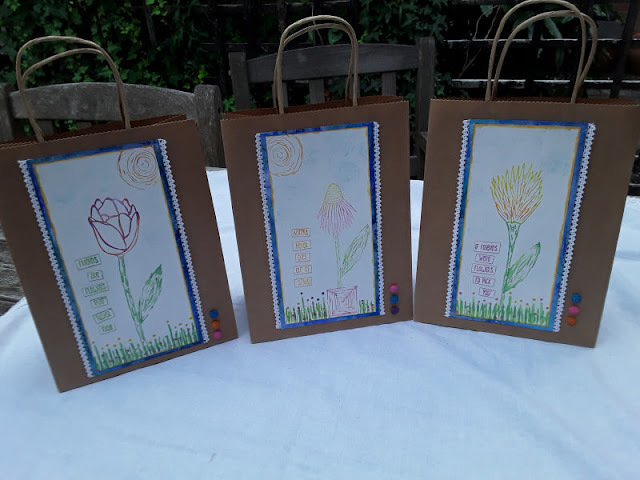 I added the sayings which went with the flowers stamps, and a piece of lace down the side of my panels, and adhered them to my Kraft gift bags. 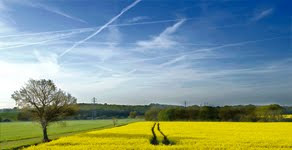 As this was very much an experiment for me, I wanted to give an honest appraisal of whether it was worth doing or not. 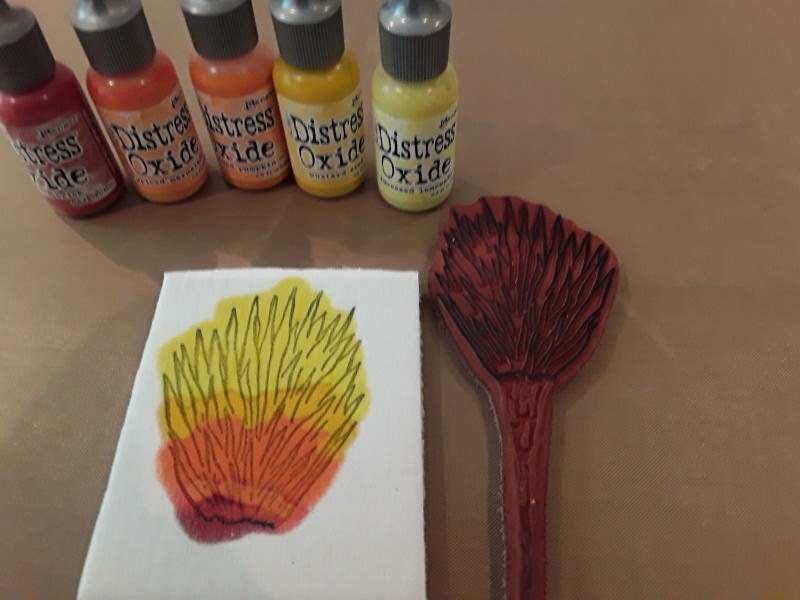 I feel the Tim Holtz custom ink pad with the Distress Reinkers and the felt is definitely worth doing but I didn't think it was so great with the Oxides as it was a completely different effect, as you needed to spritz it. Also the ink wicked a lot on the felt so if you weren't using complementary colours this might be a problem. I also felt the oxidization effect didn't particularly show up. I felt it was really worth using the felt for the mini Oxide ink pads though. I also felt the Oxide reinkers were beautiful instead of the pads for dip and spritz backgrounds. Having tried these techniques I felt that for me, I would be quite happy using just reinkers and felt and not using the pads. The ink is so concentrated and so versatile. I really enjoyed using the Ellen Vargo stamps in a different way! I will definitely be using Tim's technique for my Christmas cards this year, but maybe with his original Distress Inks! The current topic link Topic 16: Reinkers will close 17:00 (London Time) Sunday, September 30th 2018, and the winner will be announced 2 hours later at 19:00.
what a great idea, Lucy!! your gift bags look fabulous. Lovely delicate colour blending from your homemade ink pads, Lucy - the bags look so pretty! Thank you for the step by steps and the tips along the way. 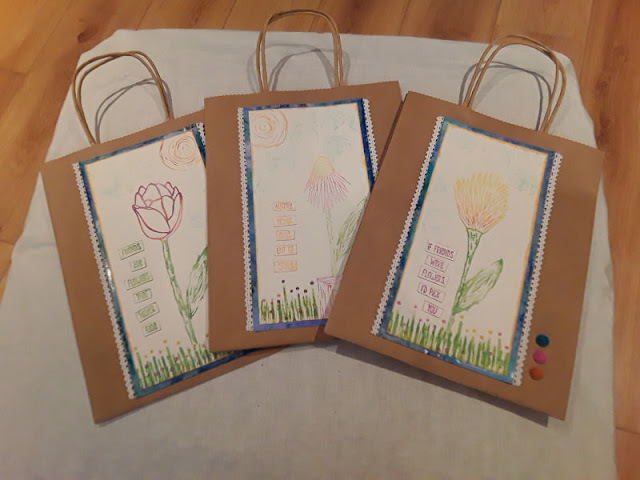 Gorgeous gift bags, so unique and thank you for the inspiration x. Beautiful panels for the bags, Lucy!!! What a great idea and really creative use of Ellen's stamps!!! Thanks for the honest assessment of the DOX for custom pads!! 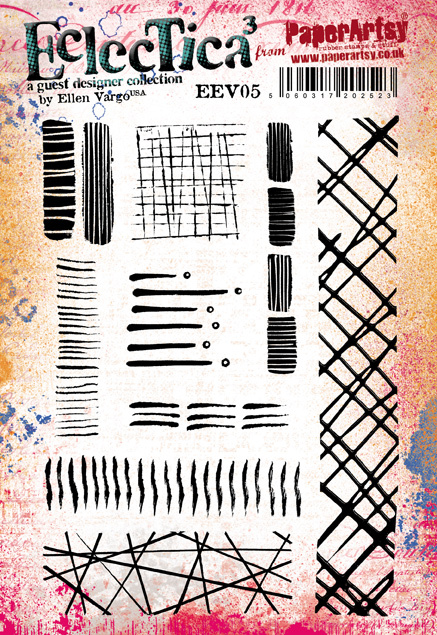 Love how you have built up your design with the stamps Lucy. You have given me ideas for my Christmas cards, thanks.